What comes first, the candle or the holder? We bet that if you weren't already planning on it, these easy projects might very well inspire you to light a few candles this wintry weekend. In any given year, there are probably only a handful of occasions that merit hauling out the formal candlesticks from their place within the dining room sideboard. For the quiet evenings and casual get-togethers that fill the rest of the calendar, candle holders ensure, not only that the wick and wax burn safely, but also that your votives, pillars, and tealights look beautiful, lit or unlit. As decorative accents, candle holders are among the many little details that help make a house a home. And while we love how they provide that finishing touch, we also love that DIY candle holders are so easy to make. Here are five favorite designs. As part of a natural tablescape or set inside a nonworking fireplace, birch-carved DIY candle holders bring the beauty of nature indoors. 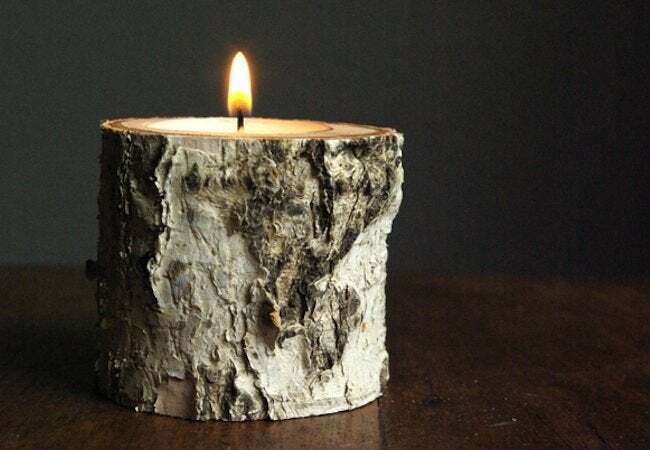 To make your own, simply flatten the ends on a cut-to-size log, and with a 1-1/2″ bit, drill a hole to accommodate a small, shallow candle. For instructions, visit Oleander and Palm. 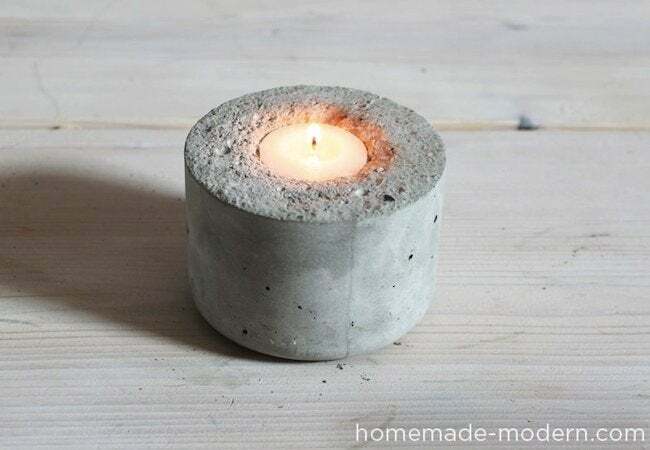 After you’ve completed your concrete countertop or concrete walkway, use any extra material to create modern, minimalist DIY candle holders. Though intimidating to the uninitiated, basic concrete projects like this one are just-add-water affairs. See how easy it can be; watch the video on Homemade Modern. 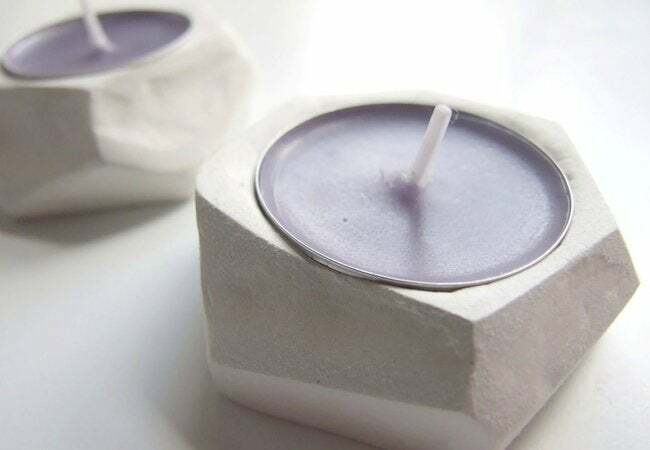 From Gathering Beauty, here are DIY candle holders made from a completely unexpected material: air-hardening clay. Mold the clay with your fingers, using a knife to facet the gem-like edges. Set a tea light into the top, and then as the last step, sit back and wait for your creation to dry—that’s right, no kiln needed! 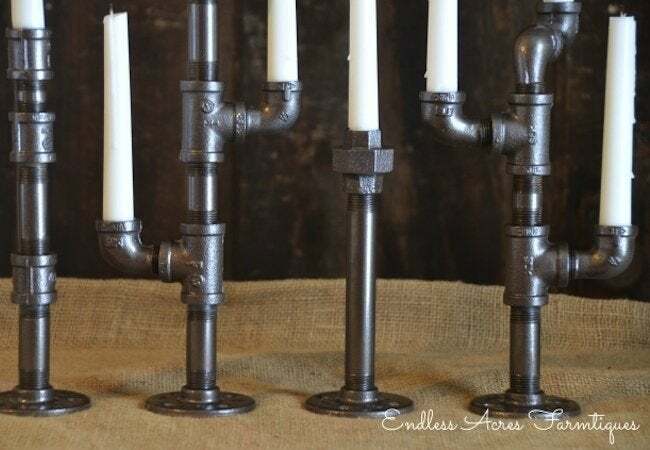 Kelly at Endless Acres Farmtiques set out to make DIY candle holders using only pipe fittings from the local hardware store. The result couldn’t be more dissimilar from traditional, fancypants candlesticks. Besides combining the pieces into your own creative assembly, all you need to do is spray-paint the metal. 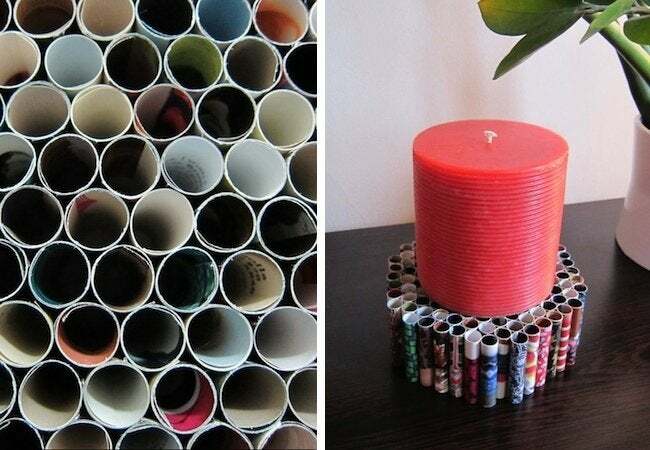 Magazines, catalogs, brochures and leaflets get a second life when folded into cylinders and glued side by side. Together, they form a column that can support even a bulky, heavier-than-usual candle. Be careful, though: You should never leave a candle unattended, particularly not one resting on a paper holder!